Oregon Rural Electric Cooperative Association’s annual pilgrimage to Capitol Hill has been an important part of the organization’s history. Years ago, astronaut Allan Bean told an audience of electric cooperative directors and senior management that sending a man to the moon—in this case, himself— took the entirety of NASA, some 10,000 employees. If one of them didn’t do his or her job, then the success of that Apollo 12 moon landing 48 years ago this month would have been compromised. Yet any monumental effort of many begins with one. That one is often one of many, as was the case of electrifying rural Oregon. Motivation to move beyond the deep Depression that gripped rural America and the far reaches of Oregon prompted the framers of cooperatives to bring hope and opportunity seen in shiny aluminum conductors traveling across mountains and Oregon’s forests. Those same heroes, likely thought of as dreamers, asked for a membership fee necessary to get the Rural Electrification Administration interested in loaning money needed to buy that sometime rare metal. That $5 Federal Reserve note was more than a rural family earning less than $500 annually could afford. Today, 26,000 miles light your home and illuminate your lives. Those lines needed some tending. Private power companies that saw no money to make serving the long and lonely stretches of Oregon thought differently when co-ops did that work. That meant forming an association to persuade legislators living in Salem that those early electrification efforts needed help—on taxes, on acquiring right-of-way, on safety codes and all the other measures, including making sure the co-op remains in the hands of the member-owners and not some distant stockholder. Today, it is called the Oregon Rural Electric Cooperative Association. 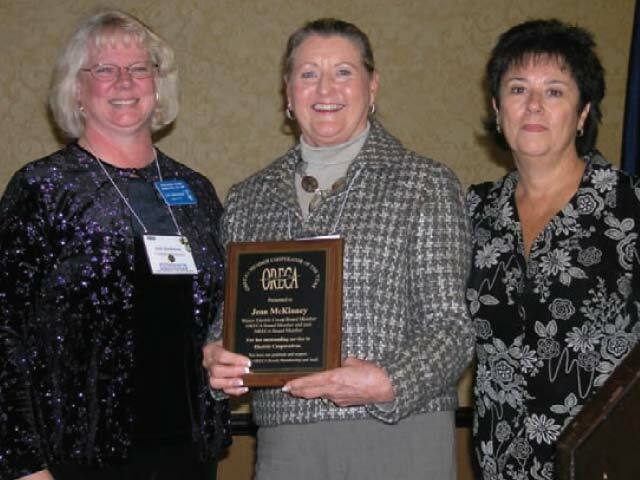 Co-op leaders, from left, Lori Anderson of Columbia Basin; Jean McKinney of Wasco Electric; and Sandy Flicker, longtime ORECA executive director; have been integral to ORECA’s success. 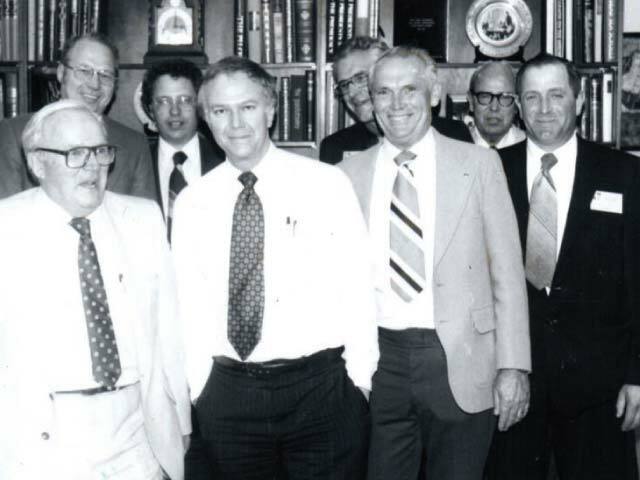 It could have been called the Association of Speckman, named for Henry Speckman and his wife, Virginia, who long represented the legislative interest of the co-ops as did their son, Bob. Telling the co-op story resided with this publication, Ruralite, which was started by Hank Alderman, who was Henry’s uncle and whose prose about electrons was read as poetry. Then I came along, hired in 1985. I did legislative work for the Nebraska Rural Electric Association. I was given the opportunity—in actuality, it was a blessing—to find ORECA a home and hire staff. The dreamers of that day included Jere Overs, manager of Salem Electric; Jean McKinney, a director at Wasco Electric; and Russ Dorran, manager of Umatilla Electric, who provided the inspiration and passion for ORECA. This association still intones to legislators that without your co-op, things would be pretty difficult in Monument, Baker City, Burns, Gold Beach, Fossil and the hundreds of rural routes where you live. The power of one appeared again in the form of Peggi Timm. Peggi, a self-described homemaker, created an opportunity for Eastern Oregon to form its own homegrown utility when the Cal-Pac sale to Idaho Power fell through. Peggi asked for a penny apiece from 700 of her friends. It could have been 7,000 had many of them not been out of town. Peggi used that 700 cents to leverage a $24.5 million loan from the National Rural Utilities Finance Cooperative Corporation to get Oregon Trail Electric Cooperative started in 1987. Today, OTEC is Oregon’s largest co-op, with 31,000 member-owners who vote on policies and decide who they want on their board of directors. 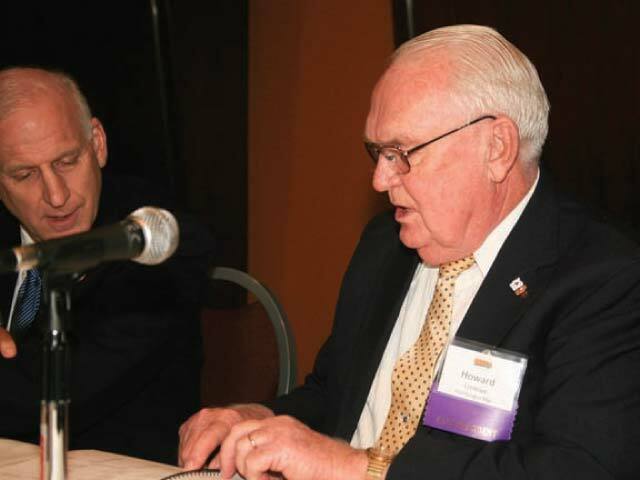 Mark Glaess, left, former ORECA executive director, and Howard Crinklaw, former Douglas Electric general manager, participate in a panel at ORECA’s 2012 annual meeting. Peggi was among the many strong and influential women who made ORECA the voice of Oregon’s electric cooperatives. So were Sara Baker-Sifford, who replaced me, and then Sandy Flicker, who followed Sara. Both Sara and Sandy’s passion for this rural electric business ensured the residents of the towering state Capitol knew well of your concerns. Now—could it be 75 years later?— Ted Case minds the ORECA store. Ted, like his predecessors, is immeasurably helped by the directors and management from 18 electric co-ops and who can be chatty when any issue—adversarial or advantageous—comes to legislators’ attention. Ted, the author of two books on the rural electrification program, is himself the inheritor of rural values learned from many, including Ted’s time with Congressman Bob Smith, once the chair of the House Agriculture Committee. And the same to all those who supported ORECA all these years. Mark Glaess’ 35 years representing electric cooperatives and public power districts include stops in Nebraska, Oregon and Minnesota. He lives in Lincoln City.